Other number GLC-675-2885 Verso Neg. No. 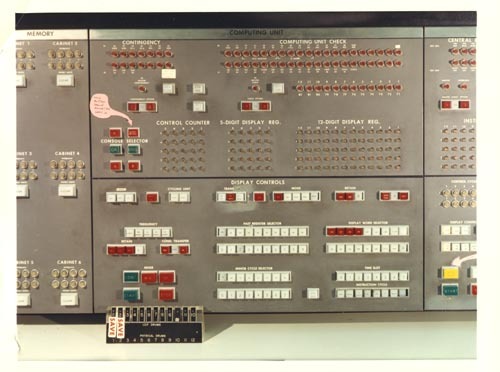 Color image of the UNIVAC LARC system Maintenance console.Buttons, lights for various system functions i.e. control counter, console selector,etc. Note on console with pointing arrow : "This button should always be left in"
Plastic holder with labels for 10 LGP Drums and labels for 12 Physical Drums. Two of the se are labeled "SAVE"
Verso: Paper sticker: "Lawrence Livermore laboratory University of California Graphics Division"